"Treat your family with a perfect Halloween dessert! Enjoy these wonderful spider web cupcakes made with white cake and whipped fluffy-white frosting. Top spider web with plastic spiders for an extra-spooky effect. You can use any flavor cake mix instead of the white cake mix, if desired." Preheat oven to 350 degrees F (175 degrees C). Line 24 muffin cups with paper muffin liners. Beat cake mix, water, oil, and eggs in a large bowl with an electric mixer on medium speed until batter is completely smooth, about 2 minutes. Divide batter between prepared muffin cups, filling each about 2/3-full. Bake in the preheated oven until tops spring back when pressed, 19 to 23 minutes. Cool for 10 minutes in the pans before removing to a wire rack to cool completely. Beat frosting and orange food coloring together in a bowl until desired shade and consistency are reached. Arrange cooled cupcakes close together in a solid circle shape on a large platter. Spread frosting over cupcakes to create one large, round frosted surface. Squeeze 1 large dot of black decorating gel in the center of the frosting. Draw concentric circles around the dot about 2 inches apart. Drag a toothpick from the center dot to the outermost circle; repeat 12 times to make the surface appear to be a spider's web. 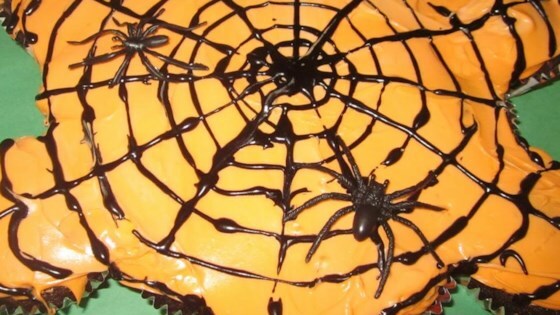 Let bats and spiders loose in your house with these sweetly spooky treats!